This week on The Digital Story photography podcast: Samsung's impressive NX300 compact system camera, Photo Help Desk: how to test for image stabilization, and retouching portraits in Aperture - All of this and more on today's show with Derrick Story. 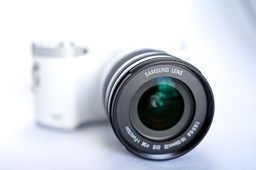 Story #1 - The Samsung NX300 camera with 18-55mm zoom lens ($649) features a 20.3 megapixel CMOS APS-C sensor. The hybrid autofocusing system uses both contrast and phase detection systems. And its burst mode records at 8.6 fps. Built-in WiFi makes it easy to connect to a variety of services and devices, including your iOS or Android smart phone. Cons: LCD-only composition, No accessory viewfinder option, Lack of built-in flash, in-camera battery charging unless you buy accessory charger. Bottom line - Excellent WiFi, outstanding image quality, well-implemented Smart Mode (with Beauty Face and Light Trace), large APS-C sensor and excellent high ISO performance make this camera a true competitor in the mirror less category. Story #2 - Photo Help Desk: Larry wants to know how to test for image stabilization. To test image stabilization, start with a lens that you know is working properly. Turn on IS and use 1/8 of a second shutter speed (Shutter Priority mode is an easy way to do this). Hold the camera with one hand and take a picture. Then turn off IS and repeat the procedure. Compare both shots at 100 percent on your computer. The image captured with IS on should be noticeable sharper. Once you have your testing system down with a good lens, then apply that procedure to the lens in question. You should be able to tell if its image stabilization is working. Story #3 -Portrait Retouching with Aperture 3 is a new title on lynda.com that helps you master Aperture's image editing tools. Some of the techniques I cover include: Retouching blemishes, enhancing skin texture, adding highlights to the hair, adjusting clothing and backdrop color, brightening and sharpening eyes, and converting to black and white. I really had fun recording this title, and I think you're going to have a blast watching it.